If you’ve been attention over the last few years, you’ll know that rugby union is on the rise in the USA. With talk of rapidly rising playing numbers and viewing figures as a backdrop, the Eagles played a home test match against the All Blacks in the autumn, and there’s a real push Stateside to use this as a springboard to boost the popularity of the sport domestically. The best way to do this of course, would be to develop a thriving domestic league, and while there’s been club rugby in America for decades now, there’s a real desire to enhance the popularity of the two main leagues – the American Rugby Premiership and Pacific Rugby Premiership. 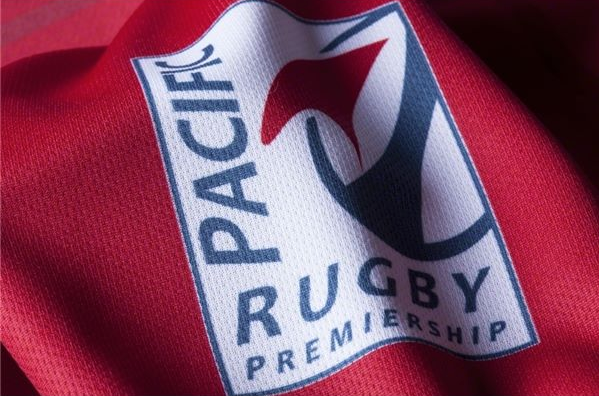 The Pacific Rugby Premiership is a seven-team tournament made up of West Coast clubs, many of which are based in California, the heartland of rugby in the US. The winner of the PRP will play off against the winner of the ARP (based mainly in Boston and New York) every season in a Superbowl-ish winner takes all championship series. The PRP has received a timely boost this season, with rugby kit institution Canterbury supplying the entire league with kit, but also churning out designs that are not just bespoke, but pretty unique, and rather unlike anything else the firm produces. We’re kicking off our look at the Pacific Rugby Premiership with the Olympic Club home shirt… and can you blame us? Just look at the damn thing! Olympic Club grew out of the Olympic Club of San Francisco – a private and athletic club based in the City By The Bay that was founded all the way back in 1860, and whose rugby team has been playing since 1908, making them the oldest club in the Pacific Rugby Premiership. Indeed, y’know the oft-made joke that the USA are technically the reigning Olympic rugby champions? Well, Olympic Club fittingly supplied several players to the gold-medal winning US Olympic rugby teams of 1920 and 1924. But what about the shirt? Well… good god just look at the damn thing. 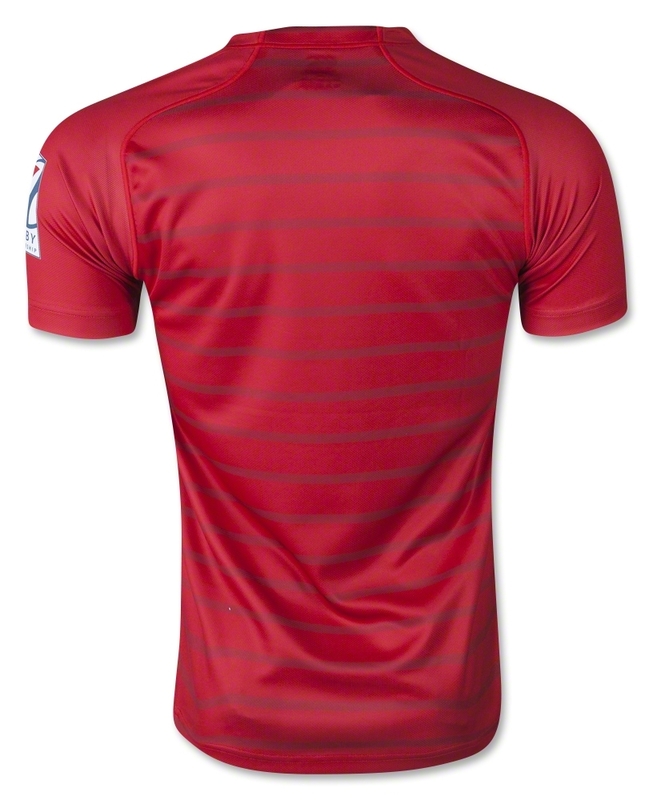 With the oh so subtle dark red pinstripes on the scarlet shirt, it would be an absolutely stunning design, but then you add the club crest and it kicks it up onto a whole other level. The ‘Winged O’ is the symbol of the Olympic Club, and has been used as both the club crest and the nickname of the club’s american football team since 1890. It was adopted by the rugby team upon their founding in 1908. It’s unbelievably cool – looking like some 1950s motorcycle club patch and the way it’s been used here is something to behold. 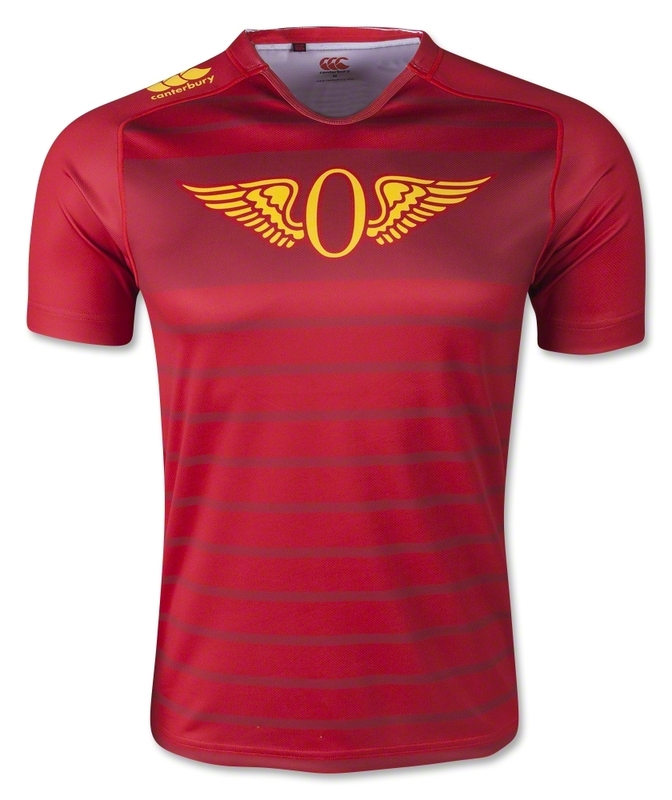 Free of a main sponsor – the unavoidable fly in the ointment of many a modern shirt design – the club crest isn’t just sitting on there all small and unnoticed, oh no… instead the crest is emblazoned in huge fashion across the middle of the chest in a large dark red panel, like a teenage emo kid’s ill-advised chest tattoo. It looks absolutely fantastic, and is so distinctive and unusual for a rugby shirt, it’s one of the most classic designs we’ve seen in any code, ever. We have a policy of only reviewing top-flight pro rugby shirts here on Rugby Shirt Watch in the past, but the Pacific Rugby Premiership is by some measure not that. And yet we’re prepared to make an exception in this case. Rugby is growing rapidly in the US, with player numbers far higher than many top-flight test nations, and a national side that is starting to assert itself in 15s and especially the sevens. This makes rugby in the USA an increasingly significant deal for all of us, and as the highest level 15s tournament in the continent, we think the PRP deserves its place with all the other club shirts you’ll see on here. Secondly… well just look at that shirt up there. When we saw Canterbury’s designs for the tournament – how unique and downright gorgeous they were –we had no doubts that they deserved reviewing. The Olympic Club shirt is one of the nicest shirts we’ve ever seen at any level, and we’re not ashamed to say our order has already been placed to add one to our collection. All the Pacific Rugby Premiership shirts are available exclusively from our international retail partner WorldRugbyShop.com, though at time of writing the Olympic Club jersey isn’t on the site, that’s hopefully going to change soon – we can’t wait!